The 20th edition of the Small Press Expo (SPX) was a huge show. 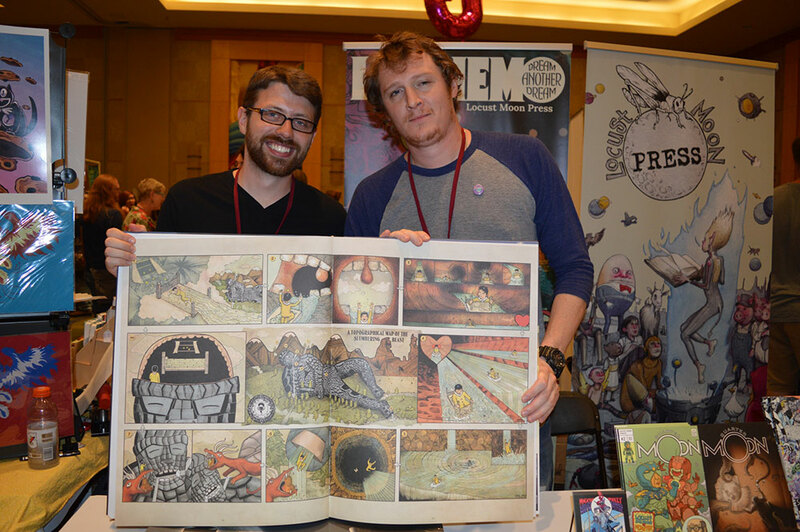 Held as always in Bethesda, Maryland, it rounds up the most important publishers and cartoonists in the North American indie comics scene, as well as some foreign artists. 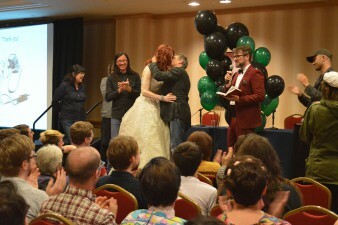 Among this year’s special guests were Charles Burns, Lynda Barry, Jules Feiffer, James Sturm, Drew Friedman, Simon Hanselmann, Michael DeForge and Brandon Graham, bringing together different styles and eras of the alternative comics culture. The programme was packed. It was impossible to follow all the panels, partly because they were often taking place simultaneously in the White Oak Room and the White Flint Auditorium of the Bethesda North Marriott Hotel & Conference Center. 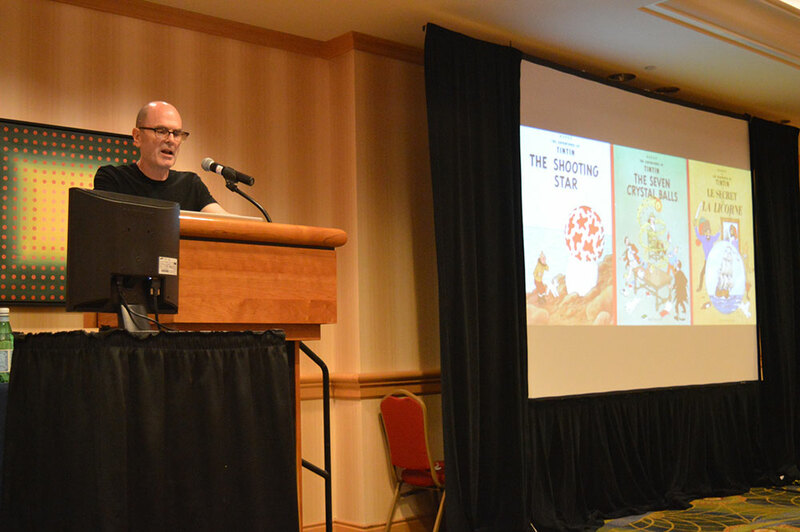 James Sturm opened the Saturday of the show, talking to Jules Feiffer, Lynda Barry, Ben Katchor, Charles Burns and Tom Tomorrow about comics in alternative weekly newspapers. Elsewhere, Robyn Chapman led an interesting discussion about micro-presses with Charles Forsman of Oily Comics, Keenan Marshall Keller of Drippy Done Books, Justin Skarhus and Raighne Hogan of 2D Cloud and Annie Koyama of Koyama Press. 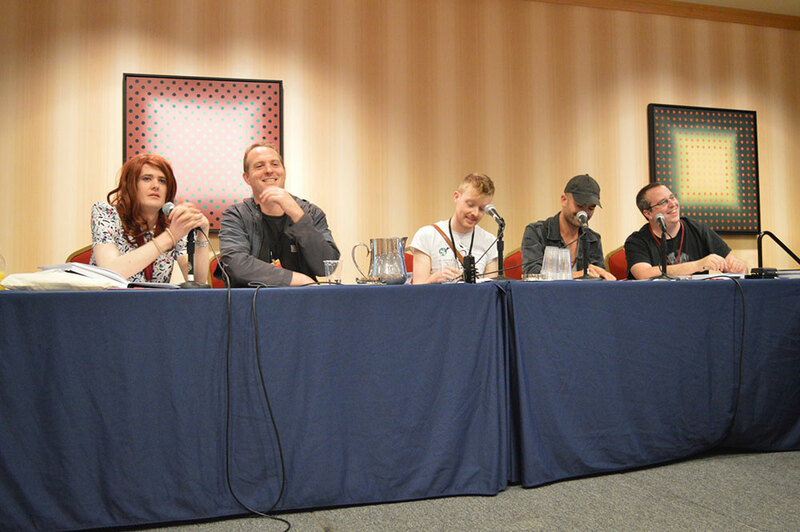 Robin McConnell also brought his Inkstuds radio show to Bethesda, interviewing Michael DeForge, Simon Hanselmann and Patrick Kyle (with the collaboration of cartoonist Brandon Graham), in what was probably the most hilarious of all the panels. A lot of the events were question-and-answer sessions with the show’s special guests. I attended the one on Sunday with Charles Burns, moderated by Alvin Buenaventura, and it was particularly intriguing to hear from the artist how he developed interest in comics and the origins of his fascination for Tintin: Hergé’s comics were indeed the key inspiration for the artist’s Nit Nit trilogy, recently concluded with Sugar Skull from Pigeon Press, which made its debut at the show. Burns showed a lot of previously unseen art and did a reading, displaying some pages from the new book. Finally he answered the audience’s questions, going deep into fascinating aspects of his creative process. Another main event was the screening of Root Hog or Die, a documentary film directed by Dan Stafford about the cartoonist John Porcellino, better known for his mini-comic King-Cat (which has run now for 25 years) and for his glorious do-it-yourself ethic. As well as the DVD edition of the documentary, Porcellino also introduced The Hospital Suite, his new book for Drawn & Quarterly. 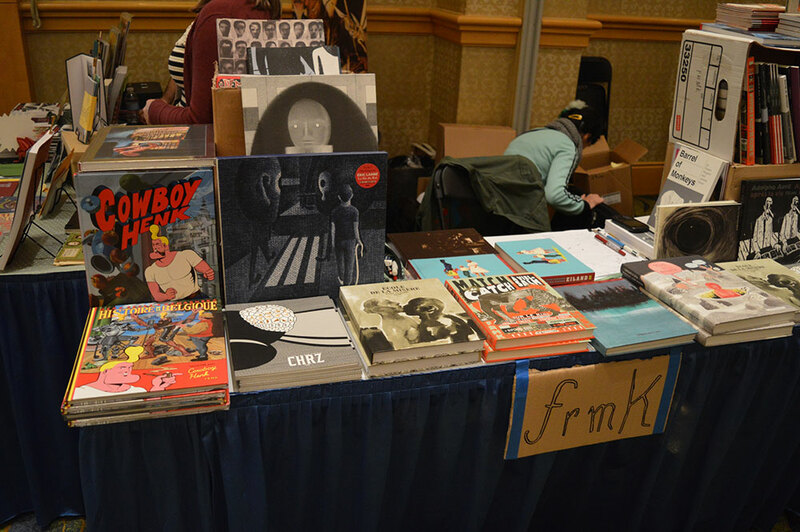 Some of the panels hosted the international guests of SPX, including the German Aisha Franz, the Iranian Mana Neyestani, the Colombian collective of Revista Larva and the Belgian cartoonists/publishers of Frémok. The Belgians in particular, represented by Yvan Alagbé and Dominique Goblet, enjoy strong popularity among American artists and readers, and their presence raised a lot of interest. Cathy G Johnson (Promising New Talent, for Jeremiah, Boy Genius and Until It Runs Clear). The tables of the nominees were marked with a blue balloon for the whole of Saturday, so that attendees could easily find their comics before voting for the award. 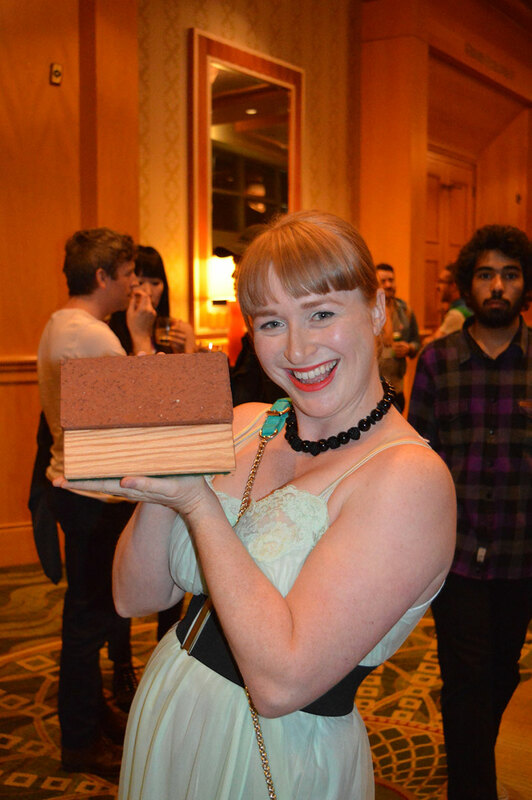 In the evening, after a speech by SPX executive director Warren Bernard, James Sturm and the cartoonist Sasha Steinberg (in a gorgeous drag-queen style) presented the ceremony, calling many cartoonists to receive the precious brick that is a trademark of SPX (the Ignatz Awards are obviously inspired to George Herriman’s Krazy Kat). The ceremony also paid tribute to the Center of Cartoon Studies in White River Junction, Vermont, the school of comics founded by James Sturm. At the end of the awards ceremony, Simon Hanselmann – dressed as a bride, naturally – celebrated his marriage to comics, represented by creators and publishers such as Michael DeForge, Julia Gfrörer, Annie Koyama and Fantagraphics boss Gary Groth, who was the protagonist in the funniest moment in the evening, giving Hanselmann a passionate kiss. Even some days later, it’s still difficult to choose one or more books as the best of SPX. 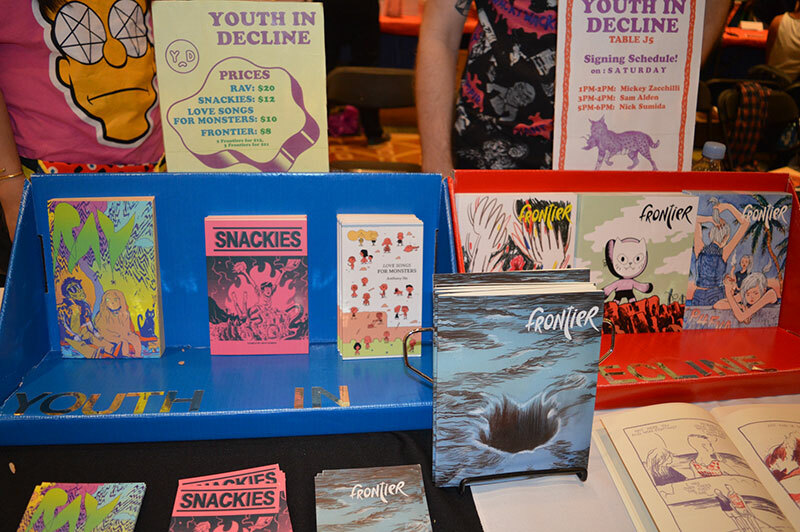 The Small Press Expo is the occasion for most American and Canadian publishers to promote their most important books of the year, so there were many equally interesting new releases. I’ve already mentioned Sugar Skull by Charles Burns, and it was surely one of the bestsellers, with a long queue to get it signed by the author. Lynda Barry with Syllabus, published by Drawn & Quarterly, had a lot of fans waiting in line for her, and took the time to speak kindly and carefully with everyone. 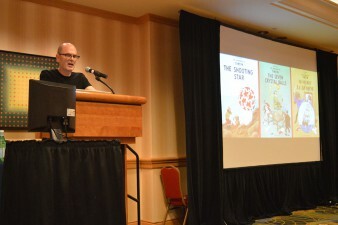 Fantagraphics brought Simon Hanselmann from Australia, and his Megahex, the first big collection of Megg, Mogg and Howl stories, was a sell-out success. The Canadian Koyama Press did well with the sixth issue of Lose by Michael DeForge; 2D Cloud and Uncivilized Books presented their common effort Dragon’s Breath and Other True Stories by MariNaomi; Hic and Hoc debuted the first collection of the stunning Scaffold by VA Graham and JA Eisenhower; the website/publishing house Study Group spotlighted the third issue of Study Group Magazine with a powerful 3D session; and Ryan Sands’ Youth in Decline hit the mark with the fifth issue of the monographic anthology Frontier (featuring Sam Alden), the first collection of Mickey Zachilli’s Rav and Snackies by Nick Sumida. Among all these books, one deserves a particular note: Little Nemo – Dream Another Dream, published by Locust Moon Comics of Philadelphia, is literally a giant tribute to Winsor McCay, and browsing its big pages – full of new Little Nemo strips by artists such as Michael Allred, Paul Pope, JH Williams III, Charles Vess, P Craig Russell, Bill Sienkiewicz, John Cassaday, Peter Bagge and many others – was a pleasure for the eyes. 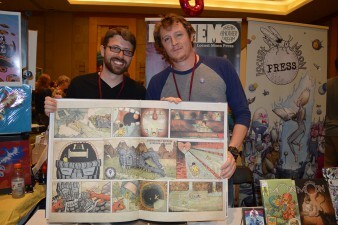 The Small Press Expo will return on September 19-20 2015 in the same location, no doubt bringing us another impressive comics show. Based in Rome, Italy, Gabriele Di Fazio was the driving force behind the local 90s comics zine, Underground. Today, his blog Just Indie Comics is one of the best sources for indie comics in his country. Gabriele is also a frequent contributor to comics website Fumettologica.